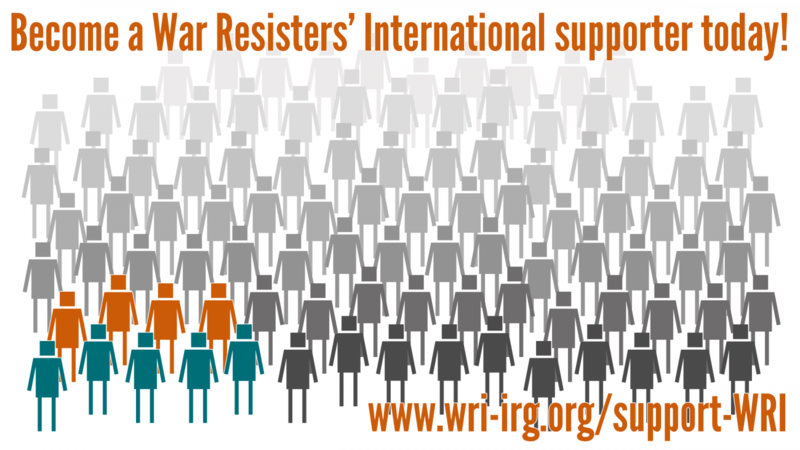 On 15th May we'll be asking the South Korean government to take the next step, finally recognise the rights of conscientious objectors, and stop sending them to prison. Share the video above and spread the word! 15th of May 2018: 4pm-6pm. In front of the Embassy of the Republic of Korea. Stülerstr. 10, 10787 Berlin. More info here. 12th May: cycle parade with World Without War. Info here. 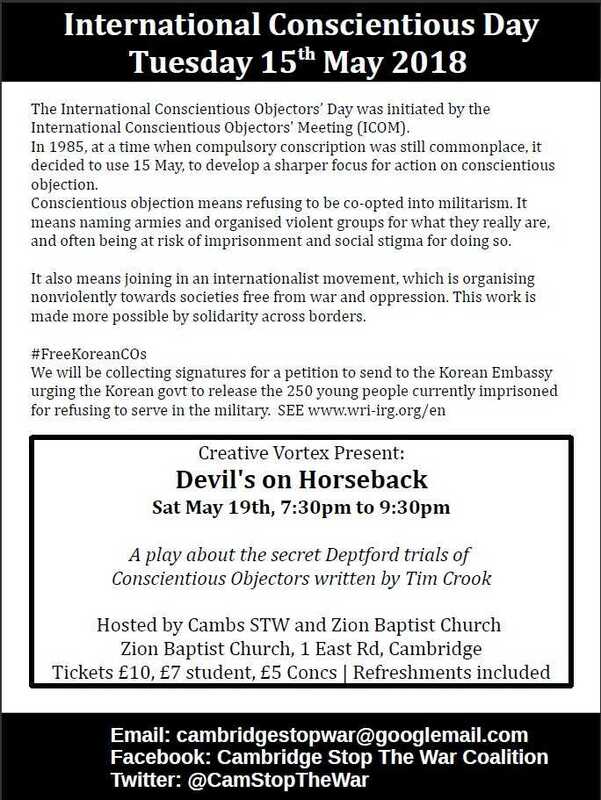 15th May: launch of the Korea version of Conscientious Objection: A Practical Companion for Movements. 19th of May: Movie screenings organised by Movement of Conscientious Objectors (Russia) in St. Petersburg and Voronezh followed by signing petitions, #freeKoreanCOs, to be delivered to the Embassy of the Republic of Korea in Russia. 15 May 2018: 6.30-8.00pm Bradford Peace Museum host 'Oh, What a Lovely War Resistance! ', a lecture by hisotrian Clive Barrett on music in opposition to war. Info here. Tuesday 15 May 2018, 6.30pm Watch the film Hacksaw Ridge at the Quaker Meeting House, Ship Street, Brighton. There will be a brief introduction followed by the showing of the film, about a an army medic in World War Two who refused to carry a weapon or kill anyone. Organised by the Brighton and Hove branch of the Women's International League for Peace and Freedom. Info here. 19th May: Production of Devil's on Horseback. 7.30pm - 9.30pm Info here. 15 May, 10.00am: Join a guided walk and morning of quiet reflection to follow the route of the conscientious objectors who built the "road to nowhere", otherwise known as "Conchies' Road" while imprisoned in the Princetown camp. 15th May: 6:30 – 8pm. Opposing War: Memorial Design Launch. Quaker Meeting House, 7 Victoria St., Edinburgh EH1 2JL. Tickets and more info here. Facebook event. 15 May 2018: 6.00-7.00pm. Join with Leicester CND and the Red Leicester Choir at the memorial to conscientious objectors on Peace Walk. You can hear about the Eritrean refugees in Leicester, many of whom are conscientious objectors, and find out news of the charter to reduce the militarisation of young people in Leicester. Info here. Tuesday 15 May: 5.30-8.00pm. Visit Liverpool Friends' Meeting House (School Lane, Liverpool L1 3BT) for a screening of the film People Who Don't Take Up Arms, a documentary about the hundreds of conscientious objectors imprisoned in South Korea. Organised by the Merseyside Peace Alliance. Info here. A new sculpture by Al Johnson will be at Bruce Castle Museum, Lordship Lane, London N17 8NU. The Lost Files explores the experience of conscientious objectors in World War One, with a focus on 350 conscientious objectors and their families from Hornsey, Tottenham and Wood Green. Info here. 15th May: 5pm - 6pm. Outside St. Ann’s Church, St. Ann’s Square, M2 7LF. More info here. Tuesday 15 May: 12.00noon to 1.00pm. Norwich Quakers are holding a vigil on Hay Hill to commemorate conscientious objectors. All are welcome. For more information email Paul Davies at daviespaul1@yahoo.co.uk. 15th May 2018: 12:30pm – 1:30pm. Meet on the Town Hall steps. Organised by Sheffield Creative Action for Peace. Info here. Facebook event here. May 15, 11:30am. Civic Center flagpole at 2180 Milvia Street, corner of Allston Way. Info here.